Join the Krewe of Vixens for the 2nd annual Teal there’s a cure race on September 15th @ the Florabama. All monies raised are donated to the Ovarian cancer research Fund. All registrations include a special dry-fit race shirt, 2 drink tickets and a meal. All this for $35 dollars. This disease is known as the silent killer for a reason. Most women will not be diagnosed until they are in advanced stages. 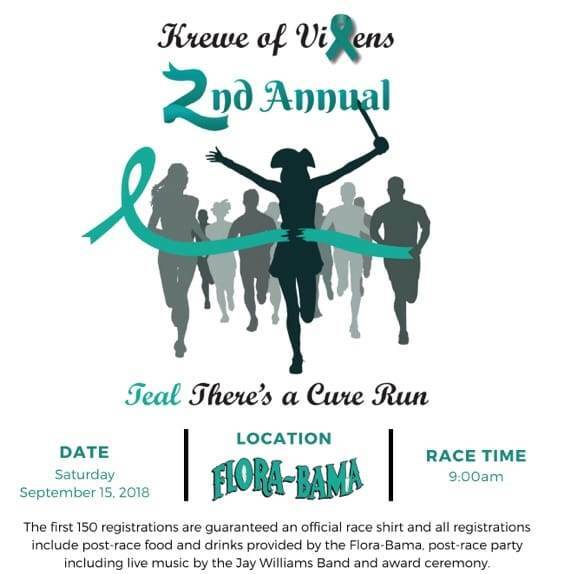 Register using the link below and help us kiss Ovarian cancer good-bye.